Founded in 1868, the orchestra of the Tonhalle Zürich has a fine reputation worldwide. In keeping with its high artistic standard and the superb quality of the time-honoured Tonhalle concert hall, the orchestra’s interim venue also had to meet the highest demands. The former industrial hall of the Maag company was therefore to be converted on a tight schedule into a concert hall with excellent acoustics. 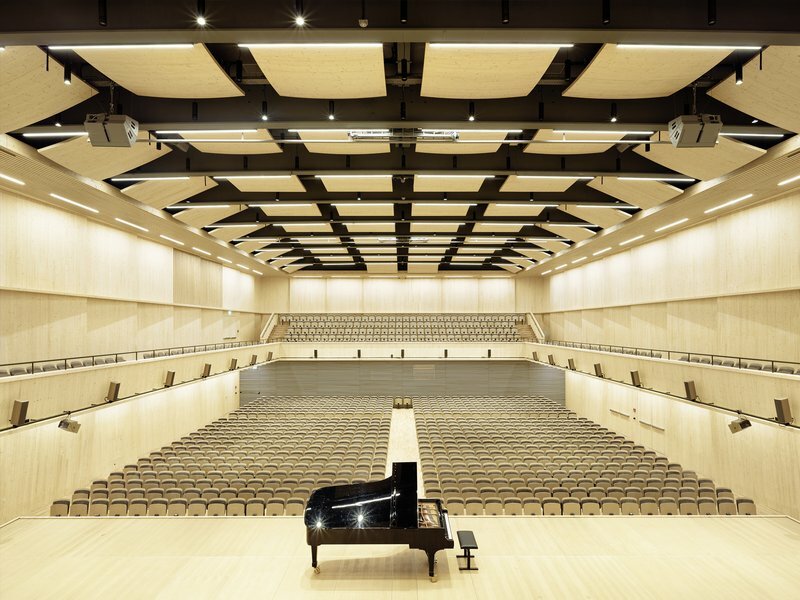 The concert hall was inserted into the former industrial premises as a «box in box», a self-contained installation made of timber elements with a support frame in steel and simple, inexpensive cross-laminated spruce panels. The classic rectangular hall has a total of 1,224 seats, 440 of which are arranged in tiers. Walking around in the hall outside the wooden installation, visitors can experience the rough and honest construction of the timber framework. The interior of the hall has a precise shape that follows the rules for acoustics. 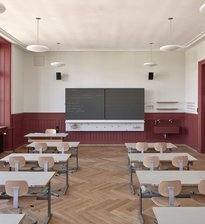 The finely angled wall panels and the convex ceiling panels break up the right angles in the interior so that sound can spread optimally. The hall itself thus turns into a sounding board. The orchestra’s provisional venue in Zürich-West invites in new and unconventional music formats while bringing classical music to the young and trendy quarter. The precise and direct room acoustics challenge the orchestra, so that the room itself becomes a guarantor for its further development.